Our barrister bookcases are hand crafted by the Amish in the original design and manner that they were made centuries ago. 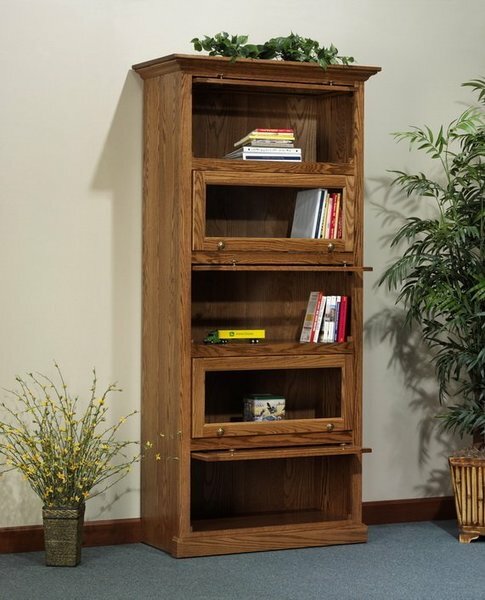 These Amish bookcases are also made from solid hardwood without using veneers, laminates or particle board! Barrister Bookcases are long prized by lawyers and attorneys but are increasing becoming more popular in homes and businesses across America for their traditional look. Our sectional bookcases are hand crafted by the Amish in the original design and manner that they were made centuries ago. Barrister bookcases are the perfect choice for the home, business library or office. They provide a beautiful, space saving display area for collectibles and valued books and collectibles. Our solid wood bookcases are built as heirloom items that will be passed on for generations. They are handcrafted in the Old World tradition, keeping true to a classic American design. Call to order stain samples to help you decide on the perfect finish to fit your home or office décor. Made of solid wood, this bookshelf is both functional and eye-catching. Quality Takes Time – Typical Build Time for This Piece is 13 to 15 weeks.